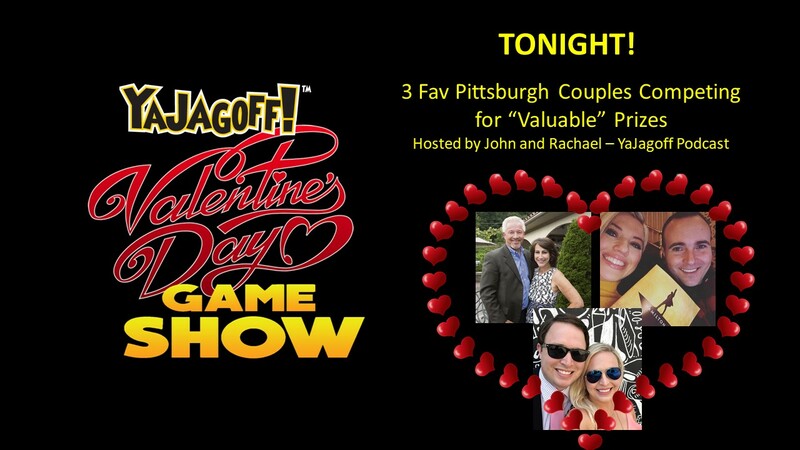 The day has come for a couple of jagoffs to celebrate Valentine’s Day with three of our favorite Pittsburgh couples, and a couple of laughs, game show style. Much appreciation to Aaron Martin and Katie Love celebrating their year-and-a-half newleywedish marriage– and more kudos to their canceled trip that almost prohibited them from attending. They were once anchors together and then moved back to Aaron’s hometown where he is an action news reporter for WPXI and she a pink-loving, social media maven. We may find out which of the two have more road rage. Last but not least we welcome the Pittsburgh treasures Paul Alexander formerly of KDKA, Root Sports and now arm candy for the Treasure Hunt Lady Shelley Duffy, who has had her share of radio and hostess gigs. These two iconic Pittsburghers are newly engaged and taking social media by storm with their family chatter and work with local charities. Which one will win at Twister? So forego Friday night TV time or the long grocery gathering trip, get in your car and join some jagoffs pulling off a game show with some greats. Byron Nash will start playing early as people arrive, so don’t show up at 9:07 ya jagoff, we will have started the star-studded show! Get Tickets at door or online HERE. Previous articleWho Moved By Groceries? We Need a Map App.